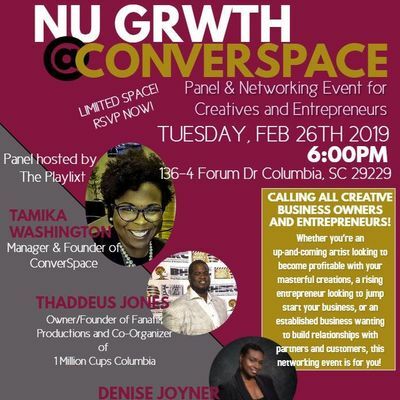 Whether you’re an up-and-coming artist looking to become profitable with your masterful creations, a rising entrepreneur looking to jump start your business, or an established business wanting to build relationships with partners and customers, this networking event is for you! Featuring a panel of successful experts to share their stories of how they started and sustained their businesses, we’ll discuss how to turn your creative hobby into a career. There’ll be a Q & A discussion, snackage provided by our great friends at AT&T, and plenty of time to connect with other artists, entrepreneurs, and consumers in attendance. Plus, every attendee will have the opportunity to receive a day pass to work in the space, a $25 value!Please share this opportunity with your friends and professional networks, you will NOT want to miss this chance to learn about all of the benefits of being apart of our Converspace community! Follow ConverSpace: IG: @converspaceFB: www.facebook.com/theconverspaceAbout the Organizers: ConverSpace is a new co-working space in the Sandhill area founded by Tamika Washington, which offers a professional resources & collaborative workspace for “work from anywhere” business owners, indie contractors, and freelancers who want a community of support in order to thrive. 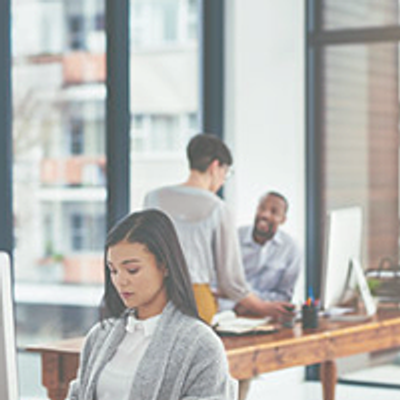 It regularly hosts events like these for members and non-members to get the most of out their co-working experience and community. 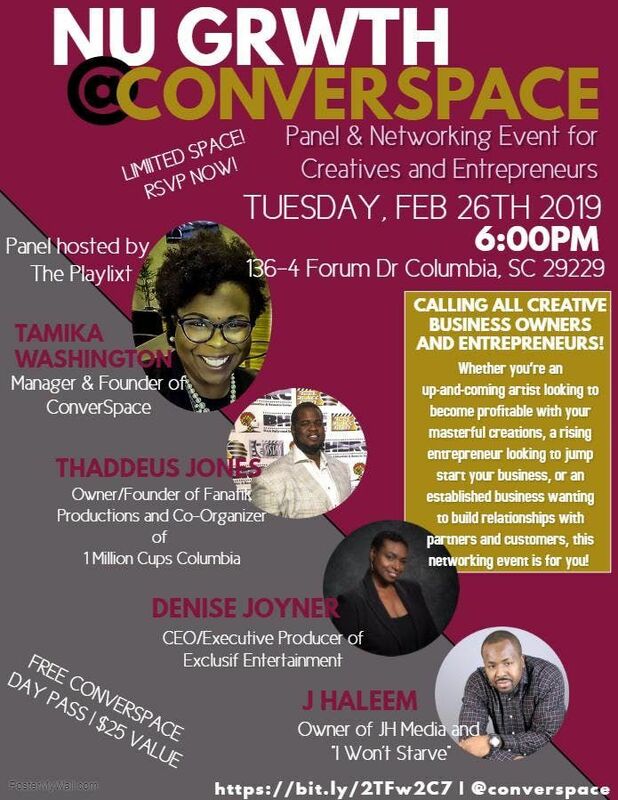 Learn more at www.theconverspace.comNU GRWTH (pronounced “New Growth”) is an artist collective founded by panel host Michael “The Playlixt” Murray, driven by connecting creatives and entrepreneurs of color both new and experienced to other contacts, resources, and opportunities they may not be aware of.Featured Panel Bios:Tamika Washington, Founder of ConverSpace Tamika S. Washington is a remote worker who started her journey of entrepreneurship because she wanted a space to work outside of the home, meet other entrepreneurs, and create opportunities for them to have conversations that spark innovative ideas and collaborations. With a leap of faith, she and her husband created ConverSpace, a co-working space in Northeast Columbia. Tamika's background is in education, coaching, training & development, and technical writing. She is a native of Columbia, South Carolina, a Benedict College graduate, and is married to Devin Washington, middle school administrator & photographer. They are the proud parents of Little Miss Faith Bellamy.Thaddeus Jones, Full - Time Filmmaker, Writer & DirectorThaddeus Wayne Jones, Jr. is a filmmaker, writer, director, and artist from Hampton, South Carolina. Thaddeus began his interest in film at an early age by making videos with classmates and writing stories in his gifted and talented classes. In high school Thaddeus worked as a photography assistant, learning the basics of lighting and photography. Thaddeus spent many years after high school discovering his talents and understanding his shortcomings. He now uses what he has learned about himself, people and his environment to influence his art, whether it is narrative films, documentaries, or photography. Thaddeus strives to give voice to the voiceless.Denise Joyner, Business Strategist and Owner, CEO & Executive Producer of Exclusif EntertainmentDenise Joyner is a Business Strategist and the Owner, CEO & Executive Producer of Exclusif Entertainment. She is the television web executive for EEWB TV and publisher of Exclusif Entertainment Magazine and Exclusif Entertainment Reporter Newspaper. In 2012, Joyner partnered with former Mississippi television anchorwoman, Connie Benson, to produce the show "Community Buzz with Connie B" which aired on the CW/13 Savannah in Georgia as a morning show for 2 years. In 2017, Denise launched EEWB TV Network (Exclusif Entertainment Web Broadcasting Television Network) under Exclusif Entertainment. It now has five channels and is steadily growing. J Haleem, Entrepreneur, Photographer, & Motivational Speaker; Owner of JH Media, "I Won't Starve", and In the Studio w/ J HaleemJ Haleem was born and raised in Newark, New Jersey where his interest for being an entrepreneur was birthed. Upon graduation he attended Benedict College in Columbia SC. While in college J pursued many ventures that allowed him to nurture his love for owning and managing businesses. With more than 15 years of experience as an entrepreneur; he now owns a few businesses and he is able to enjoy his passion of entrepreneurship and inspiring new business owners.